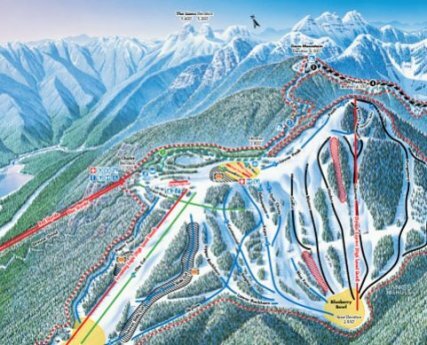 Grouse ski resort. Something for everyone in the family. Grouse ski resort is amazing. First of all, it centers the three beacons or ski mountains perched high over Vancouver and used by many to determine which direction they are facing. The lights at night and the clear field by day. Take a look at what the mountain has to offer. The mountain receives 25 feet of snow each year and has plenty of snowmaking equipment. The mountain runs are not long, the longest is 1 mile, but the 4 chair lifts, 2 rope tows, and a magic carpet move everyone around efficiently. There is an activity for the whole family at the Grouse Ski Resort. There are 3 restaurants serving a wonderful menu of goodies, and a bar. For the best hotel rates in the city Vancouver Hotel is our choice. Travel is expensive so every dollar you save leaves more room for fun. Give them a try. The Observatory Is the Crown Jewel in the resort’s dining collection offering award winning cuisine high up above the city. Altitudes Bistro is where it’s happening. Reputedly one of Vancouver’s best patios, the very cool Social Night scene, great food, cocktails and ultra chic atmosphere. Casual Dining for the quick lunch and a satisfying bite. Offering a wonderful array of nutritious fare in a self serve venue, coffee shops and more. Snowboarders will enjoy the 3 terrain parks featuring a challenging array of terrain to keep you occupied. The vertical drop is 1,200 feet. The Skiing and Snowboarding School offers one of the most respected teaching programs in Canada. Very experienced instructors will have you skiing with great confidence in a flash. It doesn’t matter if it is your first time on a board or skis, you will be delighted at the results. The next 3 minutes could change your life Forever. Snowshoeing on Grouse is a popular escape into the serene beauty of a natural winter playground. Just a short distance from the Peak Chalet, you'll find yourself a world away in our Munday Alpine Snowshoe Park. With four different groomed trails to choose from, you'll discover something new each time you visit! Be sure to tour the groomed beginner and intermediate snowshoe trails of the Blue Grouse Loop, or head for Dam Mountain - a serene loop of three main circling Dam Mountain and Thunder Bird Ridge. You can find the trails easily with clearly marked signs from the top of Grouse Mountain. Discover why snowshoeing is the fastest growing outdoor winter activity in Canada. The Ladies Only Snowshoeing Clinics are a wonderful way leading to additional fun and challenging workouts. They will cover a variety of educational topics that will help you to realize your individual goals. Discussion forums include goal setting, proper stretching techniques, sport nutrition, the benefits of cross-training, building a training program that works for you, and the mind game - developing your mental strength. Snowshoeing Fondu is a special tour combining snowshoeing and a scrumptious fondue in an evening of adventure and fun. The tour includes snowshoe and headlamp rentals, an experienced and informative guide, and an après snowshoeing delicious fondue in Altitudes Bistro to finish the evening. Ice Skating on an outdoors ice surface is amazing. Fresh mountain air, a smooth ice surface high above the city. Perfect outdoor experience. Lace up your skates and hit the 8,000 foot Ice Skating Pond, the only one of it’s kind in the area. Only a few steps from the Peak Chalet it’s fun for the whole family. Access to the pond is included in your Lift Ticket. Equipment Rentals. All of the equipment for all sports venues on the mountain are available for rent at the Grouse ski resort. Sleigh Rides are one of the most notable activities on Grouse Mountain's snowy paradise. Take friends and family on a memorable journey around the mountaintop through snow-covered forests. This is what memories are made of. You may catch the ride just behind Santa’s Workshop and rides are complimentary with your ticket. Hot chocolate and a warm fire in the lounge will cap off the fun at Grouse Ski Resort. 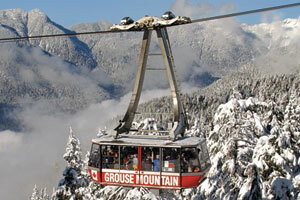 Helicopter Tours are a unique feature at Grouse Ski Resort. You may choose from 4 different lengths of tours. For instance, the awe-inspiring 25 minute flight over Vancouver's closest glacial ice-field; Meslilloet Mountain. The scenery includes; Goat, Crown and Cathedral Mountains, Pallsade Lake and Indian Arm before circling Meslilloet Mountain's Glacier. The Fly, Dine, and Drive Package is an amazing package for those who want to have an evening to remember. The Helijet will whisk you from downtown in the city to the top of Grouse Ski Resort mountain for a very special dinner at the Observatory fine dining restaurant. At the end of the evening, your chauffeured limousine will deliver you back downtown in grand style. The Skyride up is spectacular as you are carried in the glass gondola almost 3,000 feet up from the base to the Observatory. The views on the way up of the city below you will be to last a lifetime. The Skyride operates every 15 minutes from 9 am to 10 pm 7 days a week. The General Admission covers you fro complimentary access to a host of activities and exciting things to do on the mountain. Up top at the Grouse ski resort the Refuge for Endangered Wildlife is chiefly comprised of a five-acre mountaintop habitat that is home to two orphaned Grizzly bears and a Grey Wolf habitat located at the base of the mountain. The Wildlife Refuge is included with your Grouse Mountain Admission just like our Ice Skating Pond and Sleigh rides. Be sure to come up early in the day so you can enjoy everything Grouse Ski Resort has to offer.